A friend of ours, expressing more than a little discouragement after futilely tuning his Yamaha TT500, asked for some help. We gave it, and thought you might be interested in sharing the experience. The problems encountered and the solutions affected could be typical of nearly any bike, not just a TT500. In fact, we'd venture to say most ill-running machines would respond to the treatment to be prescribed. 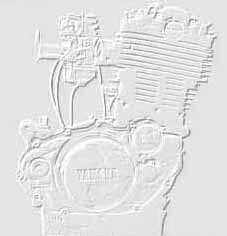 The bike's owner related that a standard Mikuni carburetor was installed in place of the original push-pull model, and since the installation, the engine was nearly impossible to start. Low speed operation was atrocious, and the normal idle adjustments seemed to have no effect whatsoever. We attempted to start the engine. It wouldn't fire. A quick check revealed the total absence of spark at the plug. The fix involved several simple but often neglected checks. All of the external ignition wire connections were loose, and the connectors were covered with a coating of fine silt-like powder (from a recent desert ride). The effect was much like that of corrosion, and the cure the same. The connectors were cleaned with contact cleaner, crimped slightly to tighten, and wrapped with tape. Besides sealing against dust and moisture, the tape will prevent accidental disconnection of the plugs. A nearly burned-through wire was routed away from the exhaust pipe, averting probable future ignition failure. An inspection of the points revealed a coating of the same powder (nasty stuff!). We cleaned the point surface with some #600 abrasive paper and contact cleaner, then reset the point gap and timing. The dry point cam and felt wick were lubed, and after checking for tight electrical connections, we replaced the point cover. The fouled spark plug was replaced with a properly gapped new one. A plastic float bowl vent hose, resting on the exhaust pipe, was melted closed. The throttle cable was improperly adjusted, preventing the slide from closing fully. The throttle cable was also improperly routed, causing it to bind. The idle mixture screw was adjusted fully closed, no doubt because of the above conditions. The foam air filter was improperly oiled. All these faults were discovered by a simple, common sense visual check and were easily corrected. With the idle mixture screw set at 1 1/2 turns, this beast-turned-beauty fired on the second kick. We allowed it to warm up for several minutes, then adjusted the idle mixture speed. A quick road test confirmed our original suspicions. There was nothing originally wrong with this motorcycle that a little attention couldn't cure. We used no exotic tools, or replaced any parts other than the spark plug. Had the owner taken the bike to an honest, competent shop, the bill would have been substantial-and a total waste of money! (The man was duly reprimanded!) The lesson to be learned is obvious: Although you can't always do everything, always do everything you can. More often than not it will be enough to keep you rolling happily, rather than leave you raving madly.